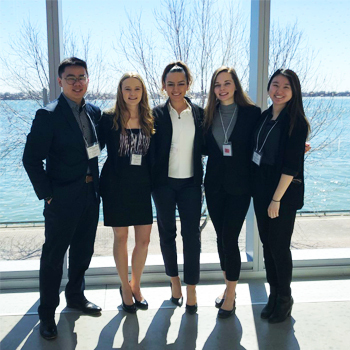 Last week, a group of undergraduate BBA students from the Lazaridis School of Business & Economics competed in the Human Resources Professionals Association’s Annual HR Case Competition. The theme for this year’s competition was Investing in the Future of Talent. The competition brought together teams from eight Ontario universities at George Brown College in Toronto. We are proud to announce that the team representing the Lazaridis School took second place in the competition! Congratulations to Dina Gjaferi, Shaylyn Keyes, Marnie McCormac, Julie Ya, and Anakin (Yu-Le) Zhou, on this great accomplishment, and thank you to faculty advisor Steve Risavy, Assistant Professor, Organizational Behaviour and Human Resource Management, for his support and guidance. The HRPA Case Competition is organized by the Toronto Chapter and is intended “for enthusiastic HR students who want to utilize their HR knowledge.” The Lazaridis School BBA program supports opportunities for immersive learning, including cases like this. The experience of participating in case competitions helps students to not only deepen their understanding of classroom learning, but to also improve their presentation skills, teamwork, and communication. Thank you to George Brown College for hosting!